Over the years, you’ve certainly read something about how Google loves fresh content. Perhaps you’ve read that sometimes it takes its love of freshness too far. Now it’s the middle of 2015. Does freshness still play a significant role in how Google ranks search results? All posts were originally published between September 2010 and March 2014. Each post was at least one year old at the time of this experiment. Only the publishing date was changed. On April 17th, the dates of these posts were set to either April 16th or April 15th, making them all look like they were one to two days old. Posts were not intentionally shared on social media. A few of the more trafficked posts likely received a couple of tweets/likes/pins, but nothing out of the ordinary. Before starting the test, I took a look at how the test posts were performing in organic search. 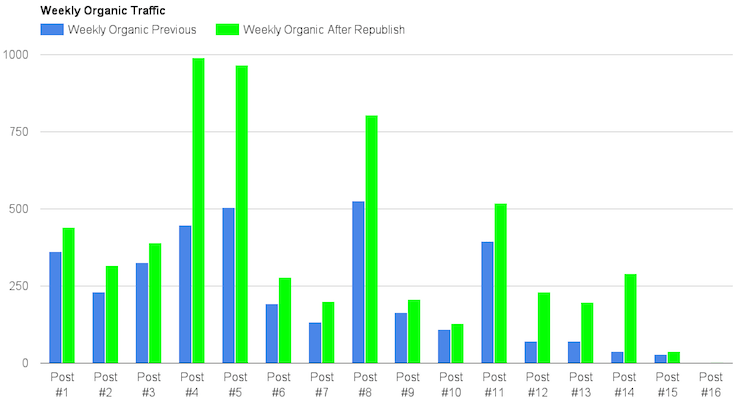 The graph below shows the organic traffic received by each of the 16 test posts for the four full weeks (March 15 – April 11) prior to the test beginning. The important thing to note here is the organic traffic received by each page was relatively static. These posts were not bouncing around, going from 200 visits to 800 visits each week. There is little variation. The blue line and corresponding number highlights the weekly average for each post, which we will compare to the graph below. This one was pretty easy to implement. It took me about 15 minutes to update all of the publishing dates for the blog posts. All posts were updated on April 17th. I began collecting traffic data again on April 26th, giving Google a week to crawl and process the changes. All 16 posts received a boost in organic traffic. 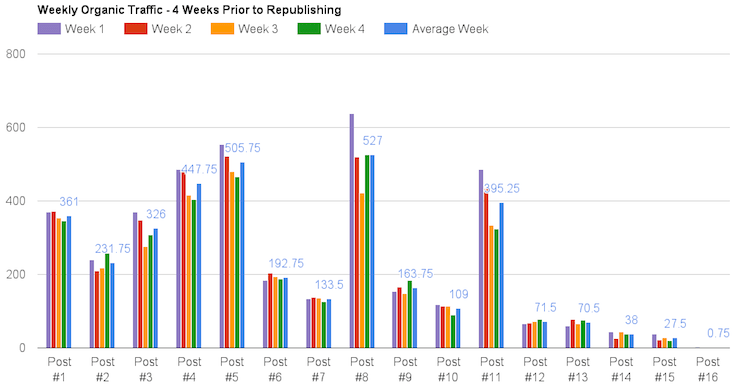 This graph shows the average organic traffic that each post received for the first four full weeks (April 26 through May 23) after republishing. I expected a lift, but I was surprised at how significant it was. Look at some of those posts, doubling in average traffic over a one month period. Crazy. Faking the date on a blog post had a major impact on my traffic levels. Post No. 16 received a lift as well, but was too small to register on the graph. The traffic numbers for that post were too low to be statistically significant in any way. It was thrown into the test to see if a post with almost no organic traffic could become relevant entirely from freshness alone. The graph below shows the percentage lift each post received in organic traffic. Post No. 14 above actually received a 663% lift, but it skewed the visibility of the chart data so much that I intentionally cut it off. The 16 posts received 3,601 organic visits in four weeks, beginning March 15 and ending April 11. (That’s an average of 225 organic visits per post, per week.) In the four weeks following republishing, these 16 posts received 6,003 organic visits (an average of 375 organic visits per post, per week). Overall, there was a 66% lift. Below you will find a few screenshots from Google Search Console showing the search impressions for a couple of these posts. Note: Sixteen screenshots seemed like overkill, so here are a few that show a dramatic change. The rest look very similar. What surprised me the most was how quickly their visibility in the SERPs jumped up. It’s safe to assume the lift in search impressions was caused by improved keyword rankings. I wasn’t tracking rankings for all of the queries these posts were targeting, but I was tracking a few. The first two graphs above show a dramatic improvement in rankings, both going from the middle of the second page to the middle of the first page. The third graph appears to show a smaller boost, but moving a post that is stuck around No. 6 up to the No. 2 spot in Google can lead to a large traffic increase. Here is the weekly organic traffic data for four of the posts in this test. You can see an annotation in each screenshot below on the week each post was republished. You will notice how relatively flat the traffic is prior to the test, followed by an immediate jump in organic traffic. These only contain one annotation for the sake of this test, but I recommend that you heavily annotate your analytics accounts when you make website changes. Did these posts all receive a major traffic boost just from faking the publishing date alone? Better internal linking? Updating a post date brings a post from deep in the archive closer to your blog’s home page. Link equity should flow through to it more easily. While that is certainly true, six of the 16 posts above were linked sitewide from the blog sidebar or top navigation. I wouldn’t expect those posts to see a dramatic lift from moving up in the feed because they were already well linked from the blog’s navigation. Mobilegeddon update? In the Search Console screenshots above, you will see the Mobilegeddon update highlighted just a couple of days after the test began. It is clear that each post jumped dramatically before this update hit. The blog that it was tested on had been responsive for over a year, and no other posts saw a dramatic lift during this time period. Google loves freshness? I certainly think this is still the case. Old posts that rank well appear to see an immediate boost when their publishing date is updated. If you update a blog post’s date, will it receive a boost in the SERPs? Maybe. Can you fake freshness? Yes. Do you have to make changes to the content? No. If there is a boost present, how long does it last? In this case, approximately two months, but you should test! Should you go update all your post dates? Go ahead and update a few blog post dates of your own. It’s possible you’ll see a similar lift in the SERPs. Then report back in a few weeks with the results in the comments on this post. First, though, remember that the posts used in my test were solid posts that already brought in organic traffic. If your post never ranked to begin with, changing the date isn’t going to do much, if anything. Don’t mistake this as a trick for sustained growth or as a significant finding. This is just a small test I ran to satisfy my curiosity. There are a lot of variables that can influence SEO tests, so be sure to run your own tests. Instead of blinding trusting that what you read about working for others on SEO blogs will work for you, draw your own conclusions from your own data. For now, though, “fresh” content still wins.